Fall is close, yet so far away. And because there is this weird Fall alike weather going on, there's not much shopping going on or Summer looks. I blame weather. Or maybe I have become comfortable with my wardrobe. Of course there are always space for some good basics and shoes. I caught myself craving lots of shoes lately, yet I picked up on sales just one pair, so far. I really had to press myself hard not to buy, because how many shoes one person can have.. Especially if there's not much spaces in wardrobe where to keep. I try to be very sensible and talk myself out of buying, because there are lot of them in my cart waiting. Thank you for being so understanding while I have been away taking care of my fiance. I really missed blogging. I don't want summer to be over , i'm really loving the light clothing. Your neck piece is gorgeous and I haven't got much space for my shoes either.you look gorgeous. Stai benissimo tesoro, troppo carina la tua collana! Really love that necklace, got a similar one! you really have an eye for style. i love how you dressed up this simple jeans and tee combo. Fab! I love those thin heels! They instantly dress up your outfit. I've been really wanting to buy shoes as well, I feel like on the shoe and accessory front, I'm really lacking in variety, all I've got are the basics. Hopefully your fiance is alright, and you're back soon! Loving this cute casual look! That necklace is fabulous! Such a great statement necklace! Cute outfit! Loving that denim! AHH i LOVE this!!! it's such a cute look!! That necklace is to die for!! So gorgeous! Ramona, you are rocking this look! Love your denim and your necklace, so so so pretty! Awww! Pretty you are !! Lovely pictures and very pretty sandals I must say. Kisses! 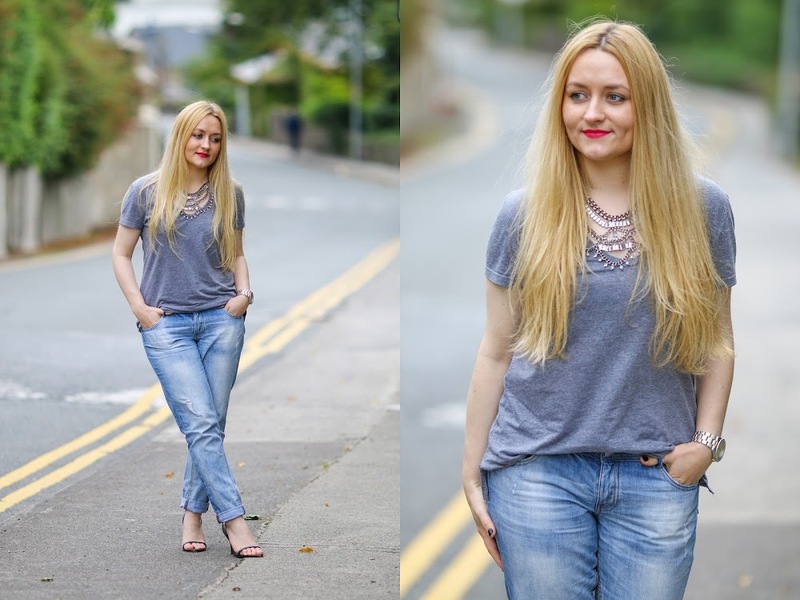 Red lips, heels and statement necklace makes simple t-shirt and jeans look terrific! Love the contrast between the casual t-shirt and jeans with the red lips and that beautiful feminine necklace. Overall this is a perfect outfit, dear! Love the necklace with the more casual tee- great look! That necklace looks great with that tee Ra! I love the necklaces by The Happiness Boutique. Had a chance to model one myself. Love this head to toe look. I blame weather. Or maybe I have become comfortable with my wardrobe. Of course there are always space for some good basics and shoes. I caught myself craving lots of shoes lately, yet I picked up on sales just one pair, so far.